A new, atmospheric restaurant in Parel promising auth­entic, chilli-­pac­ked Thai cuisine. “Oh Cha!” That is what happy gourmets in Thailand declare after a splendid meal. That is also the name of the new, atmospheric restaurant in Mathurdas Mill Compound in Parel promising auth­entic, chilli-­pac­ked Thai cuisine. Situated in an old mill stru­cture, O:h Cha is hung with enormous cane lanterns that draw the eye to the high ceiling and old skylights. The walls are clad with astroturf, ­while the rest of the decor is minimalist and in shades of grey and white. The menu in O:h Cha is packed with app­ealing options. Spicy fried banana blossom cakes or salmon and raw mango salad? Stir-fried morning glory with chilli and garlic or roasted pork ribs with honey glaze? After taking advice from the staff, we opt for the fiery Tom Yum Soup. Both the shrimp (Rs 325) and vegetable (Rs 275) versions are flavourful and—though nose-­streamingly spicy—are a hit. The Beef Satay (Rs 450) is tender and served with a lovely peanut sauce. 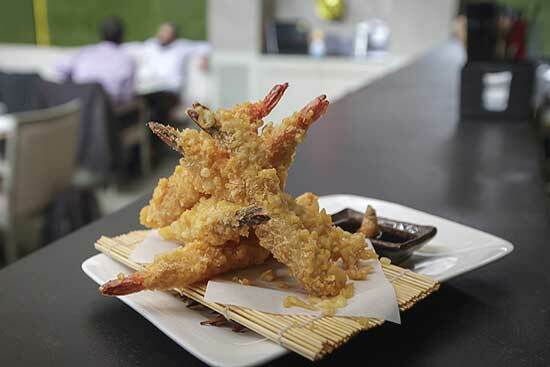 While the Prawn Tempura (Rs 600) is a golden mountain of fat, succulent prawns, fried and served with a piquant soya-­ginger-radish sauce. For the main course we choose Four Friends (Rs 450)—a combination of asparagus, shitake mushroom, broccoli and white fungus in a subtle, soupy soya bean sauce. The light, fresh flavours provide an interesting contrast to the fabulous Crispy Pomfret (Rs 950). While the Red Curry with Roast Duck (Rs 575) balances the spiciness with the flavour of lemon grass. For dessert we opt for a delicate Lemon Grass Creme Brulee (Rs 225), which arrives with a mild personality disorder. For while the top layer is nicely warmed, the bottom is fridge-cold. This, however, is the only minus point in an otherwise wonderful meal.